Then I entered the fitness industry and learned a bit more; no, a lot more about the importance of drinking water. I jumped on the trainer bandwagon preaching to clients the importance of drinking a minimum of eight 8 ounce glasses of purified spring water every day. I’d step off my soapbox to the groans of my clients protesting, “I hate water; it’s so…boring.” Or, “can’t I at least have diet soda?” “At least?” I wondered? At-least-can-I-destroy-my-bones-with-phosphoric-acid-and-leave-my-body-craving-the-sugar-it didn’t-get-when-it-tasted-“sweet”-in-that-diet-soda?” No, you can’t. Sodas (of any kind), juices, fruit, coffee, tea, anything wet, or anything with calories, is not water. Water stands alone. In the same way you’ll never smoke cigarettes once you learn what it does to your body, you will want to drink water all the time, when you learn what it does for your body-inside and out. For example, when people become more serious about getting in shape; beyond the general health benefits of exercise, it is usually because they want to achieve one or both of the following goals: lose fat and/or gain muscle. Drinking water plays a big role in achieving both-not to mention maintaining general health and proper immune-system function, water’s anti-aging potential and more. If you think water is important to your muscles because they are 75% water, know that our brains are 80% water and each of the five components of fitness: cardiovascular endurance, muscle strength, muscle endurance, flexibility, and body composition require neurological reactions which rely on a brain that is properly hydrated, not to mention the water these five elements require for proper performance. How does water actually get into the brain and other tissues? Water molecules enter our cells through one of three processes: diffusion (think of what happens when a single drop of food coloring is released into a bowl of still water), movement of water molecules through special channels that bring it into the cell, and through osmosis. You might remember the term osmosis from high school biology. It refers to the passage of water from an area of high concentration to one with a lower concentration. These processes are based ideally, on pure water, as opposed to water that has had anything added to it. 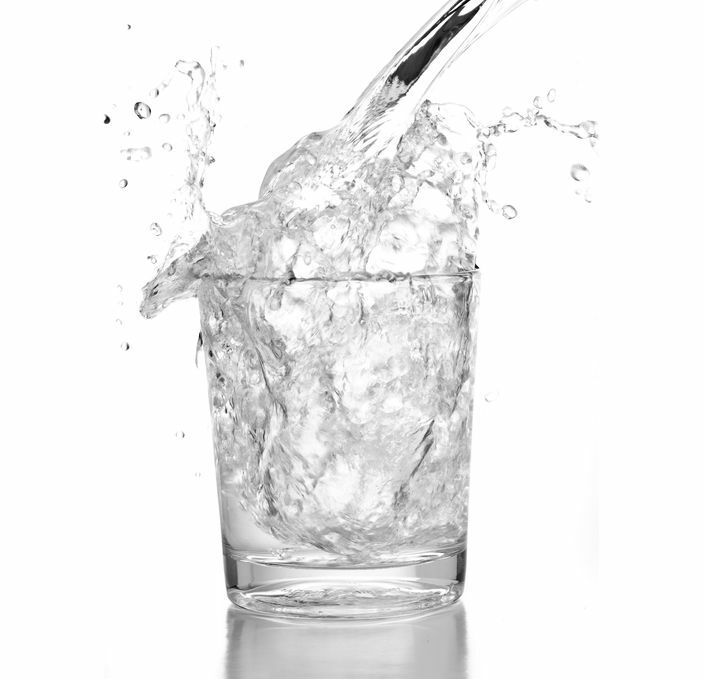 In their book Water: Hydrate for Health, authors William Holloway and William Sickert state “…adding any substance to water-coffee, tea, sugar, flavorings, colors, proteins-decreases the concentration of the water molecules and lessens the pressure required for osmosis to occur which, in turn, reduces absorption. That’s why it’s important to drink pure water.” According to Holloway and Sickert, the fewer the additives, the more pure the water and the higher the “osmotic pressure;” setting the stage for the best possible hydration. • Serves as a way to bring vitamins, minerals and other nutrients into cells and assists with digestion, absorption, transportation and use of those nutrients. • Ensures the elimination of toxins and wastes. • Contributes to proper body temperature and energy production. Today, supermarket shelves are packed with water-like alternatives from pH balanced water, water with added electrolytes, sugary sports drinks and their alter-ego artificially-sweetened sugary sports drinks. These drinks (“formerly” considered water) contain fructose, corn syrup, crystalline fructose, sucralose, sugar and/or salt and will deliver about 30‐50 calories per 8 ounces serving (with typically 2 servings per container). If they aren’t loaded with sugars, then they have added artificial sweeteners, some of which have been found to be dangerous. What about tap water? If you’re thinking “that stuff can kill you!” you’re not alone. Strangely enough, purified tap water can be the highest quality water you can drink-expensive yes, but worth it. There are basic water purification systems that screw into your kitchen faucet, and comprehensive systems that attach to your home’s water main, bringing cleaner, purer water to drink and bathe in than you could ever buy in the supermarket-and without the plastic bottles to add to the landfills. Consider using a stainless steel water bottle as many plastics, when warmed by the sun, are toxic. Of course I am! Maybe you're better at it now? Let's see...half your body weight in ounces a day...so you should be drinking about...50 ounces? Yeah, that's about right.